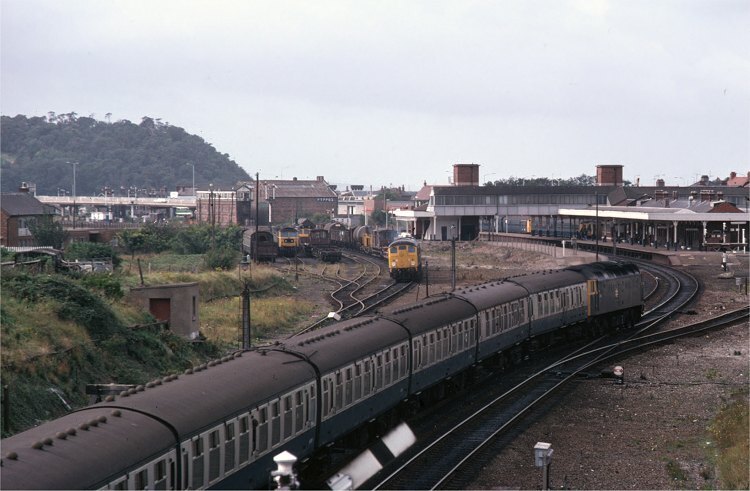 Moving on to September 1978, and Llandudno Junction and a Class 24 feature again. Here we have a panoramic view of the station and sidings taken from the road bridge at the east end of the station. A Class 47 arrives on the 11:00 from London Euston to Holyhead, whilst 24035 waits in the sidings with Trip 30, the local freight from Holyhead to Mold Junction. Also present is 25100, which would work light engine to Bangor to work the 17:55 parcels to Crewe, and a Class 47. Just visible are Class 101 and Class 108 dmus waiting in platform 1a to work the connecting 15:01 service to Llandudno. 8th September 1978. The track layout at this end of the station was remodelled and simplified when No 1 signal box was closed. It was remodelled again in 1983 when the station was resignalled and a new signal box built. Following the first rationalisation, access to the yard was only possible from the west end. 24035 will have to reverse its train out of the sidings onto the main line towards Bangor, before crossing over and running through platform 2.